How would you like to cut U.S. carbon dioxide emissions by 10% next year, and 25% in just a few short years? We can do it with little net cost. We can become more prosperous and happy at the same time. Or we can become miserable and suffer under thousands of pages of new laws and regulations to accomplish the same end, albeit more slowly. Conservation is the quickest way to cut carbon dioxide emissions. It only takes a few weeks to set up a car pool, switch to compact fluorescent lights, adjust thermostats, etc. And we have plenty of higher efficiency appliances, air conditioners, cars, etc. already on the market but not utilized to their fullest. It is simply a problem of getting people to take options that are readily available. And yes, it can be a big, nay enormous, problem if done incorrectly. It would take a police state to track everyone’s energy habits and correct them. ‘Tis far better to risk a few feet of extra sea water. Not only that, not all conservation options are appropriate for all people. Car pooling is not always an option. Have a look at my long list of potential global warming solutions. I guarantee that you will agree that some of them are very bad. But we may not agree on which are the worst. Propose forcing people to take inconvenient actions and you generate more opposition than energy savings. Mr. Brown loves compact fluorescent bulbs and puts them in all his light sockets. Carl (that’s me) despises them, but he doesn’t use that much electric lighting anyway. He uses an older technology called a “win-dow.” As for the evening, he keeps the light level low so can fall asleep readily. LED lights suffice today for low level lighting. Fred spends thousands super-insulating his house. Bill spends dozens super-insulating his body with long underwear. Louis commutes to work in his 48 mpg Prius racking up 24,000 eco-friendly miles per year. Mr. Wilson still has his ancient land yacht which gets 16 miles per gallon, but he drives less than 8,000 miles per year, thereby burning less fuel. Al Gore burns through thousands of gallons of fuel jetting around the world warning its leaders about the perils of global warming. Bubba drives a big old truck and votes Republican, but lives in a trailer -- which uses far less fuel than Al’s mansion. Sally drives slowly, which saves fuel. David loves speed, but he also loves to tinker, converting several cars and trucks to run on waste vegetable oil from restaurants. I could go on, but you get the idea. There are many possible ways to save energy. If we mandate from above, we will force many people to save energy in ways they consider annoying. This raises the “price” of energy conservation, and thus raises the political resistance. This is a bad idea, even if a pro-environmental political coalition manages to get a majority in Congress. We need to cut carbon burning in the U.S. not just to reduce emissions directly, but also to create an example lifestyle that the developing world can imitate as they grow richer. Moreover, one size fits all top down solutions can backfire. It may well make environmental sense for Al Gore to travel the world in a private jet and entertain world leaders in his energy-hogging mansion to make the case that we need to stop global warming. No single person or bureaucracy can come close to figuring out the optimal path. The possible permutations of conservation and energy alternatives are endless, and the true preferences of individual citizens are unknowable. Oh, we could put the options up for a vote, but we wouldn’t get an honest answer. 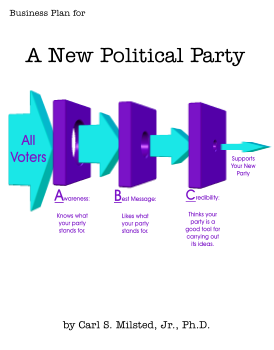 Our plurality-take-all voting system only works for two alternatives at a time; that’s why we have a two-party system. We could do somewhat better with Score Voting, which allows voters to express their preferences among many alternatives, but in this case voting would still fail. It’s easy to vote for wind power when you don’t live in a windy area, so you won’t have to stare at ugly windmills all the time. It’s easy to vote for bicycles when you are young and live in a flat town with a nice climate. It’s easy to call for small cars when you are single and have no children. Any vote would be horribly biased and result in great rancor. We could convene a blue ribbon panel and/or commission many studies. University professors and beltway bandits salivate at the opportunity. With focus groups, demographic and regional breakdowns (FGDRBs) and comprehensive assessments of energy alternatives (CAEAs), the geniuses could generate a million PowerPoint slides and a few thousand impressive acronyms. But they’d still get it wrong. Polls and focus groups are notoriously unreliable for determining true preferences. People don’t truly weigh costs vs. benefits until it comes down to actually buy something. But the science of marketing has made progress in anticipating future revealed preferences. And technical wonks might do better than the voters at large in assessing which technologies are practical, so this approach could prove better than a nationwide vote. But what would we do with the information if we had it? Mandate an optimal mix of conservation and new energy technologies? How? Do we take these studies and generate a comprehensive plan and post it in the Federal Register? Then, do we hire an army of bureaucrats to enforce these regulations? “Hi, we’re from the government and we’re here to turn down your thermostat.” You think the Tea Partiers are angry now, just wait until you propose this comprehensive plan. Civil War II here we come. How about the carrot instead of the stick? We could create an alphabet soup of helpful programs ranging from How Much You Can Save by Adjusting Your Thermostat (HMYCSAYT) to a National Car Pool Rider Registry (NCPRR) to Money for Insulating Poor People’s Homes (MIPPH) to... Confused? Want to know how to get your fair share of Uncle Sam’s billions to save energy? ASK LESKO! Not only can we create hundreds of thousands of government jobs, we can support sleazy infomercial entrepreneurs as well. Yay! Or, we could simply ask the public to burn less fossil fuels, and let them figure out how to do it. Let The People decide. How can the government send a message to the people to burn less fossil fuels without spying or micro-managing? Answer: tax carbon. Assess a per pound tax on coal, oil, and natural gas based on the carbon content of these fuels. The higher the tax, the more urgent the message. If we need to cut carbon use by 50% in ten years, make the tax high compared to the current price of fossil fuels today. If we have several decades to reach this target, phase in the tax slowly to minimize economic disruption. It’s that simple. But it’s not simplistic. A carbon tax sends a simple signal: the price of fossil fuels is higher. But the resulting actions are complex. Hundreds of millions of consumers will alter their behaviors in innumerable ways. Some will conserve. Some will buy alternative energy, and some will just pay the tax. And yes, we can live with that. Those who use an unfair share of the atmosphere’s carbon absorbing capacity pay a subsidy to those loveable eco-hippies who use less. Admittedly, this is a boring solution. It’s more fun to play Armchair Commissar, contemplating the optimum path towards carbon-free energy. Assessing a carbon tax is too easy: put a few meters on oil refinery input pipes, tanker depots and power plants and we’re done. Yawn! “Fortunately,” we can make things a bit more challenging for the armchair commissars in the audience. A carbon tax sends a signal to the market, but a rather significant fraction of the economy is outside the market. Government plays major direct roles in infrastructure building, especially roads and public transportation. Government will always have a major role in nuclear power; the general public has a major stake in safety concerns that cannot be fully addressed with liability law. Government also motivates consumer behavior through many subtle mechanisms, affecting where people work and live and whether they work and consume or relax and conserve. We’ll explore many of these matters later, but first let us look more closely at a carbon tax, for by this mechanism we can achieve our first 10-20% cuts almost overnight. The damage caused by carbon burning is nonlinear. Climate fluctuates whether we burn carbon or not. A little bit of global warming is thus lost in the noise. Warming above the noise can cause some damage, but if it is slow enough the environment and the economy can easily adapt. Animals migrate. Plants also migrate, albeit slowly. Beach houses wear out regardless of ocean levels. Ditto for buildings in cities. On the other hand, fast changes in climate can destroy good buildings and kill off plants faster than they can migrate (without human help). Rapid change is expensive. And if the response to carbon dioxide emissions involves positive feedback (such as the permafrost emitting trapped methane), then the function above is more nonlinear yet. A bigger value of x produces a bigger ratio, a bigger marginal cost. We could play some interesting politics debating x. Or, we could be strict and keep x as small as possible and still have measureable effects, and adjust our carbon tax over time as nonlinear effects creep in. This is the theoretical economic optimum if we ignore beneficial side effects of a carbon tax. But it is somehow unsatisfying. What if the calculated tax is so small as to have no noticeable effect on economic behavior? What’s the point, then? What if it is so big as to cause economic collapse? What is the optimum value of a carbon tax even if global warming is a myth? That’s right: a carbon tax is a very good idea even without climate considerations. If we tax fossil fuels today, we have more fossil fuels in the future. The only thing we lose is time value -- if the tax is too high. If the tax is too low, we are squandering oil that would be better saved for future use! Economist David Friedman pointed out in his Price Theory textbook, that oil prices are too low because the owners of oil wells have insecure property rights. Instead of holding oil for future, more expensive, sales, they are taking the money now while the taking is good. Because of insecure property rights, the market for fossil fuels is inefficient. A carbon tax may well lead to a more efficient market! Moreover, a carbon tax is easy to collect. You cannot hide an oil refinery or a coal fired power plant. I’ll make this case again and several others in my next chapter where I make a conservative case for a carbon tax. If the Right was rational, they’d jump on the carbon tax bandwagon -- if a carbon tax will be used to replace a tax that conservatives hate. In subsequent chapters I run the numbers for using a carbon tax to replace the income tax, or using a carbon tax to replace payroll taxes. Finally, I provide some carbon tax calculators so you can design your own carbon tax, to balance the budget, fund an improved Lawrence Welk museum or whatever. So yes, I have plenty for the pipe smoking professors in the audience to chew on, even though a carbon tax is a brain dead simple solution for global warming. So chew away, and eventually I’ll get around to some more solutions, solutions not so easily implemented through pure market incentives.